Iowa teachers attended the Iowa Jump$tart annual Personal Financial Literacy Conference June 28-29 in Ankeny, where they had the chance to participate in inspirational and engaging sessions on teaching personal finance, and gain a wealth of ideas and resources to take back to their schools. The first day of the conference, sponsored by the Iowa Insurance Division, included a variety of keynote and breakout sessions. The second day, sponsored by Next Gen Personal Finance, provided teachers with a chance to earn continuing credit by participating in a FinCamp session. Plus, five Iowa teachers were awarded scholarships to attend the Jump$tart National Educator Conference Nov. 3-5 in Cleveland, Ohio. Below are a few of the highlights from the conference. The conference began with an introduction to the Money Smart Week essay contest. Attendees heard the 2018 winning essay read by winner Hope Dohlman, an 11th grader from Crestwood High School. The contest, designed for students in grades 7-11, takes place each March, with winners announced during Money Smart Week each April. The top ten finalists receive financial awards ranging from $300-$500 sponsored by the Iowa Bankers Association, with the first-place winner receiving a $1,000 prize. Click here to learn more about the essay contest. Jacob Clifford led an engaging opening keynote session on getting students excited and engaged in learning about personal finance. An economics teacher from California, Clifford is also the creator of the popular YouTube channel ACDC Leadership, which features a variety of fun and engaging lessons on economics. He offered five strategies for engaging students, including 1) Focus on selling, 2) Convey your excitement, 3) Make lessons applicable, 4) Invite students to practice concepts, and 5) Give immediate feedback. Click here to visit Clifford’s YouTube channel. Ryan Decker gave the lunch keynote session on how to broach the subject of money when talking with students and how to help students improve decision making when it comes to personal finance by utilizing behavioral economics concepts. Decker is an assistant professor of economics and finance with the Center for Economic Education and Financial Literacy at North Central College in Illinois. Concurrent breakout sessions ran in the morning and afternoon, and included the topics of teaching soft skills; integrating STEM, math and financial literacy; using technology resources from the FDIC; student loan options; EVERFI financial literacy program; teaching demand and supply concepts; personal finance for teachers; helping first in family students with college planning; and helping students evaluate the pros and cons of immediately joining the workforce or going to college first. The conference concluded with the announcement of the five winners of scholarships to attend the Jump$tart National Educator Conference. Winners were: Kyle Leonard, Lamoni High School; Kathy Degner, Muscatine High School; Kelly Parriott, Dowling Catholic, West Des Moines; Annette Knott, Missouri Valley High School; and Del Buchman, ADM, Adel. Business Horizons is looking for Iowa high school students (grades 9-12) to join in the fun this summer at Business Horizons 2018! During the week-long program, students from across the state team up and take part in exciting competitions as they navigate the world of business and entrepreneurship alongside Iowa professionals. Students gain hands-on experience, receive advice from expert speakers, explore career options in Iowa and develop their leadership and professional skills. Business Horizons provides valuable college and career experience for all students, regardless of career interest. Participants can also earn college credit and a Central College scholarship by attending. If needed, program scholarships and/or financial assistance is available to attend. Contact info@businesshorizonsiowa.com with questions. Visit www.BusinessHorizonsIowa.com to learn more, nominate students to attend, download applications and view program videos. You can also download the 2018 brochure for more information. Tihanna Brown is the winner of the 2018 Money Smart Piggy Bank Pageant contest, receiving a $100 award. With the contest, children design piggy banks to learn about financial literacy. Sponsored by the Community Bankers of Iowa, the Money Smart poster contest provides students in grades 2-6 with the chance to submit posters that depict “Why is it important to know about money?” for the chance to win a certificate of deposit (CD). The grand prize winner receives a $600 CD. Second and third prize winners receive a $300 CD. Presentation photo (left to right): Randy Ludwig, Market President, Fidelity Bank & Trust, Tiffany Wulfekuhle, Customer Service Rep (Fidelity), Vicki Rahe (mother), Vivienne Rahe, Andy Rahe (father), Joan Steger, Asst. Vice President of Retail (Fidelity). Iowa student Kaylee Lowe and her teacher Kathy Paul each received at $250 award for participating in the Money Smart Cache! contest. 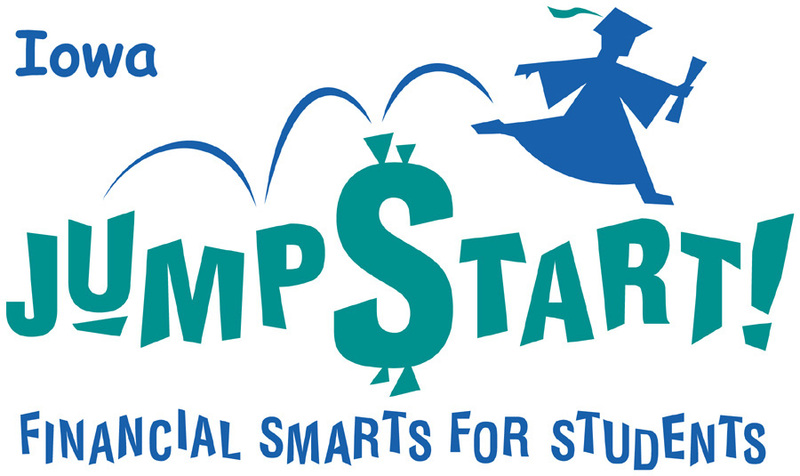 One statewide prize is awarded each year from Iowa Jump$tart to an Iowa student and teacher who participate in the contest. Kaylee is a student at North Union High School in Armstrong, Iowa. Kathy is the family and consumer science teacher at the school. Professional Educators of Iowa (PEI) is offering three personal finance courses this summer especially for educators, which also offer the opportunity to earn one credit for licensure renewal for each course. The first course, Teaching STEM Career Readiness and Financial Education, will be offered June 18-19. The second course, Teaching 21st Century Financial Literacy, will be offered June 25-26. The third course, Personal Financial Literacy for Educators, will be offered July 16-17. All courses will be held at the PEI Conference Center at 974 73rd Street, Suite 30 in West Des Moines. Click here to register online.